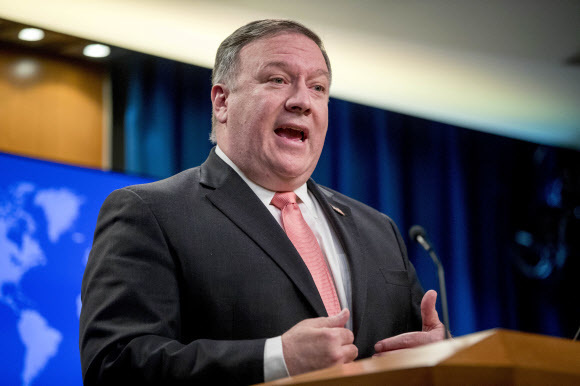 The United States is working to achieve North Korea's commitment to dismantle its nuclear weapons program, US Secretary of State Mike Pompeo said Thursday amid deadlocked negotiations. Pompeo also said in an interview with Kansas-based KNSS Radio that the two sides will continue to have meetings, including a possible second summit between US President Donald Trump and North Korean leader Kim Jong-un. "We still are working through the execution of Chairman Kim's commitment to denuclearize," he said. "We are hopeful that in the new year President Trump and Chairman Kim will get together not too long after the first of the year and make even further progress on taking this threat to the United States away from us." Hours earlier, the North's state news agency issued a commentary slamming the US for its "misguided" understanding of "denuclearization of the Korean peninsula" -- a commitment Trump and Kim made at their first summit in Singapore in June. Nowhere in their joint statement did the two leaders commit to "denuclearization of North Korea," the Korean Central News Agency said in an English dispatch, asserting that "when we refer to the Korean peninsula, they include both the area of the DPRK and the area of south Korea where aggression troops including the nuclear weapons of the US are deployed." DPRK is the abbreviation for North Korea's formal name, the Democratic People's Republic of Korea. The commentary also leveled its criticism at Pompeo. "The State secretary of the US who took part in the epochal event in Singapore himself is asserting that 'north Korea committed itself to complete, verifiable and irreversible denuclearization of north Korea there.' This is something aghast," it said. Asked about North Korea in a separate interview the same day, Pompeo phrased the objective differently, although it's unclear whether that was intentional.